As our first workshop of the 2018 season, we look forward to welcoming back Scottish artist Margaret Evans! Margaret will be joining us from March 18-24, 2018 and expanding her Unleashing the Pastels curriculum for artists of all mediums! Margaret herself will working in pastels, but will also bring watercolor, gouache, and water soluble pens for additional demonstrations. In advance of her workshop, Margaret took a moment to answer a few questions we had about her approach to art. ME: I have to remind myself of what I preach when getting into difficulties! I make it fun, and remind all to keep an open mind and willingness to gamble. ME: A quick morning tidy up before starting work – otherwise i can’t find anything and trip over things. Q: Who are your art heros? ME: Robert Wade (AUS) and John Singer Sargeant. ME: Working on large scale corporate paintings and exhibiting outside Scotland. Learn more about Margaret’s Unleashing The Spirit workshop with us here. Find out more about Margaret on her website and give her a follow on Facebook & Instagram to see what she’s up to! It was a whirlwind 3 days with Margaret Evans of Scotland! Margaret usually teaches a 5 day workshop for us every other year, but due to popular demand we just had to fit Margaret in for a workshop this year, too! The group enjoyed a day at a local farm. The marvelous painting in the foreground is Margaret’s demo. A grand time was had around the dinner table – delicious food and lively conversations. Margaret will be back in 2014 for her usual 5-day workshop. You don’t want to miss it! The weather seemed intent on making Margaret Evans feel right at home with a bit of mistiness every day, in between the sunshine. On Thursday, the group went over to Olana, the historic home of Frederick Church. When lunch was delivered at noon, the class was still in their gear but having a good time in spite of the drizzle. Soon after lunch, the sun came out to reward the class for their enthusiastic spirt! Margaret always brings out the party spirit in all her students. 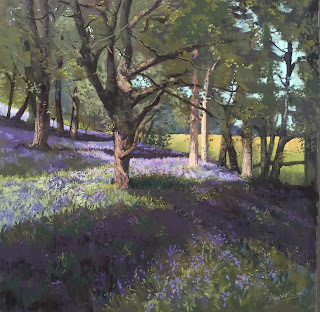 Next year Margaret will be back again, this time to teach a 3-day workshop on the versatility of pastels! David Taylor’s class finished off the week with one and half days at Coeyman’s Landing. The first day it started raining soon after they got there that they were only able to get photo references, but it was such a subject rich location that everyone decided that it was worth going back the next day, which cooperated by being a beautifully sunny Fall day. Back at the inn for the final dinner on Friday night, David showed off his style by wearing his new Crazy Tie (a hand-made quilted tie featuring guitars) and fabulously colorful socks! 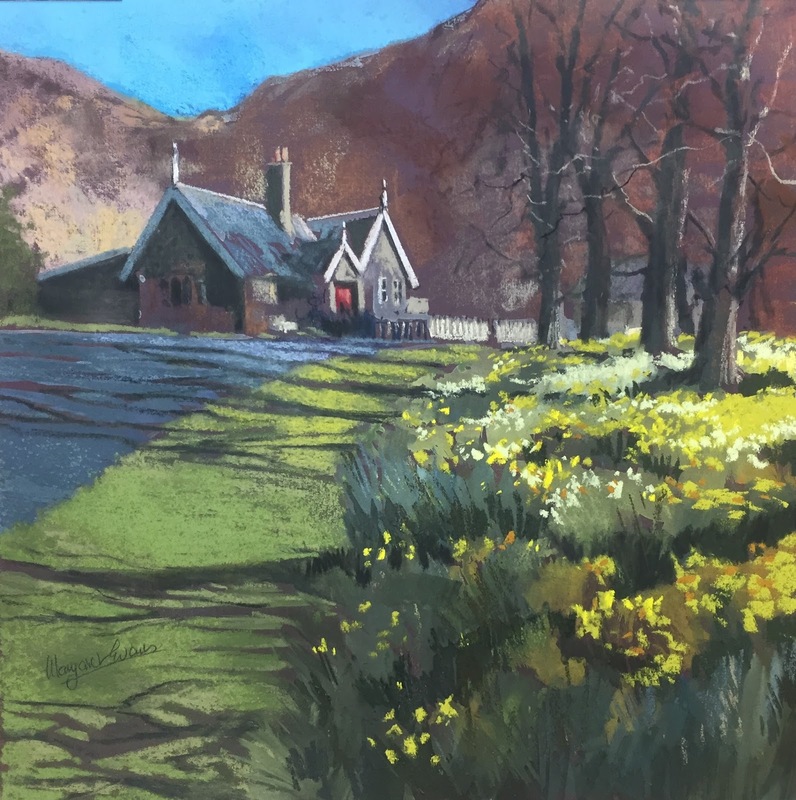 This week Margaret Evans of Scotland is here teaching a 5-day pastel workshop. After lunch, Margaret presented a demo outside with the Carriage House as the subject. We’re crossing our fingers for more good weather for more outdoor painting!